In Oregon — which has the highest kindergarten vaccine exemption rate in the U.S. — about 95 percent of parents whose kids skip one or more vaccines use a print-your-own certificate to do so. That’s according to data from the Oregon Health Authority, which shows that of more than 31,500 non-medical vaccine exemptions submitted last year, nearly 30,000 were documented by parents who watched an online education video and then printed out a do-it-yourself form. Fewer than 2,000 chose the second option: to talk to a health care provider and obtain a signature. The state, where 7.6 percent of kindergartners were exempt from one or more vaccines in the 2017-18 school year, has had an education requirement for non-medical exemptions in place since 2013. But Oregon state Rep. Mitch Greenlick, a Democrat who has proposed a bill to eliminate non-medical vaccine exemptions, criticized the online educational module. It’s clear why parents are overwhelmingly choosing the online option, said Dr. Saad Omer, a vaccine and infectious-disease expert at Emory University in Atlanta: convenience. Omer and other public health officials find this trend worrisome, because kids who remain unvaccinated can catch — and spread — dangerous diseases such as measles, posing a risk to themselves and the wider community. In the U.S. this year, at least 387 cases of measles have been detected in 15 states, according to the Centers for Disease Control and Prevention. Most of the cases are clustered in six outbreaks, including an outbreak centered in Clark County, Wash. 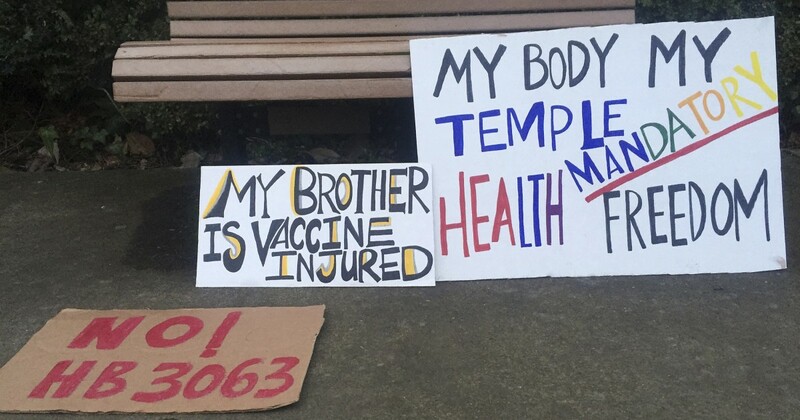 The county is part of the Portland, Ore., metro area, a well-known hot spot for vaccine hesitancy. At least 78 cases of measles have been linked to that outbreak, with four of those confirmed in Oregon. The state has reported six additional measles cases not linked to that outbreak. Across the U.S., nearly all cases of the highly contagious disease have occurred in unvaccinated children, officials said. Evidence shows, however, that making it more difficult to obtain vaccine exemptions can reduce the rates of those who opt out. “The ease of exemption is a big predictor,” said Omer, who has been named the inaugural director of the Yale Institute for Global Health, starting in July. He favors counseling by a health care provider as one good way to strengthen requirements. That not only makes it harder to get exemptions, but also puts parents in touch with “the most trusted source” of information, Omer said. In Washington state, overall vaccine exemption rates fell by about 40% after passage of a 2011 law that required a health care provider’s signature on exemption forms, according to a 2018 study by Omer. In 10 of the states that allow personal or philosophical exemptions, a parent’s signature on a statement or a form is all that’s required to opt out. In three states, the paperwork has to be notarized. Only two states — Washington and Michigan — require consultation with a health care provider. Since 2015, when Michigan began requiring parents to participate in an education session at their local health department, vaccine waiver rates fell from 4.8 percent in 2014 to 3.6 percent in 2017, said Lynn Sutfin, a spokeswoman for the Michigan Department of Health and Human Services. Utah, with a 5.2 percent kindergarten exemption rate, began allowing use of the 20-minute online education module last summer. Since then, more than 8,700 certificates have been printed, said Rich Lakin, immunization program manager for the Utah Department of Health. But the new option is rife with problems, said Lakin. People have submitted fictitious names such as “Mickey Mouse” into the system, he said. Others have used the web-based portal to criticize health officials for requiring documentation for exemptions. Jennifer Margulis, 49, of Ashland, Ore., said she has used the state’s online education module to exempt all four of her children from some vaccine requirements. She said the video, which takes about 40 minutes, requires active participation — clicking through a series of screens. She said the online option is a good alternative for parents who want to make their own choices about vaccination, despite scientific evidence and advice from public health officials. But a legislative aide, Adam Lohman, said Golden wasn’t aware so many Oregonians were opting out of vaccinations using the online module. “He would be interested in an option that preserves parent choice and makes it more stringent,” Lohman said.